Four years ago I sold a locomotive I no longer wanted, and with the extra cash I decided to buy something I normally wouldn’t. I went down to the local hobby shop and bought a book that caught my eye, “Where the Rails Meet the Sea”. Mainly due to a picture of a very interesting freight terminal that was once in New York. The more I studied it the more intrigued I became with it (ok, maybe obsessed). The complex trackwork was hard to believe! 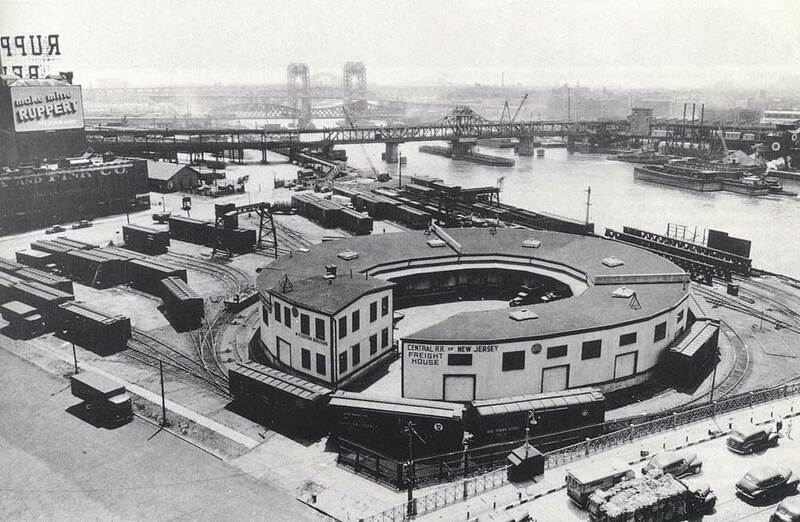 An entire rail yard, freight house, car ferry and engine house in about 1 acre. I had to build it. Fortunately for me online there was a pretty good track diagram of it, but little else. 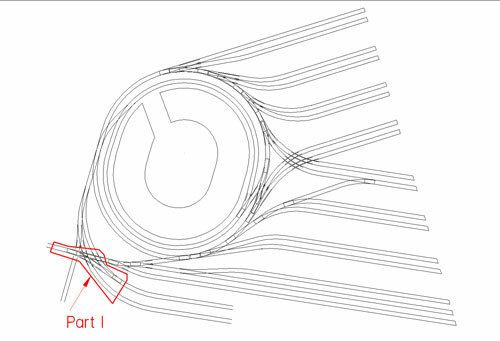 I studied the track plan for quite some time and decided to re-draw it accurately in CAD. 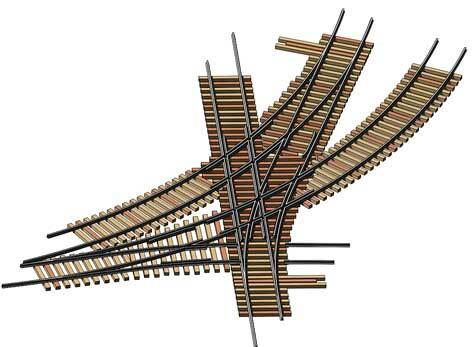 Building the trackwork would be an extremely difficult task. Possible, but likely well beyond my skills. For a while I had been tossing around the idea of making a fixture to assemble turnouts at the workbench, and thought this approach might work well for something like this. I spent a bit of time contemplating how to make a fixture and worked out some of the details to manufacture a prototype. I did a few test tries on some scrap wood. The initial tests worked quite well, and I built a few #6 turnouts with it. I was quite impressed myself, and decided to use the fixture to build turnouts for my Port Kelsey which I was just getting started on. Well to make a long story short, a few people spotted the fixtures and wanted one for themselves. Ron, my brother also saw an opportunity with them and offered to bring them to market online. And Fast Tracks was born. Four years has gone by and still no Bronx Terminal. Until now. I don’t have much in the way of an overall image of the terminal. I do have one, but it is packed in a box somewhere as I still haven’t unpacked all my model railroad stuff after our latest move. Once I locate it I will post it on the site. For now, you will have to refer to the track plan. Tonight I completed the first piece of the Bronx puzzle, the triple lapped turnouts at the engine house end of the facility. This is on the lower left hand side of the drawing. 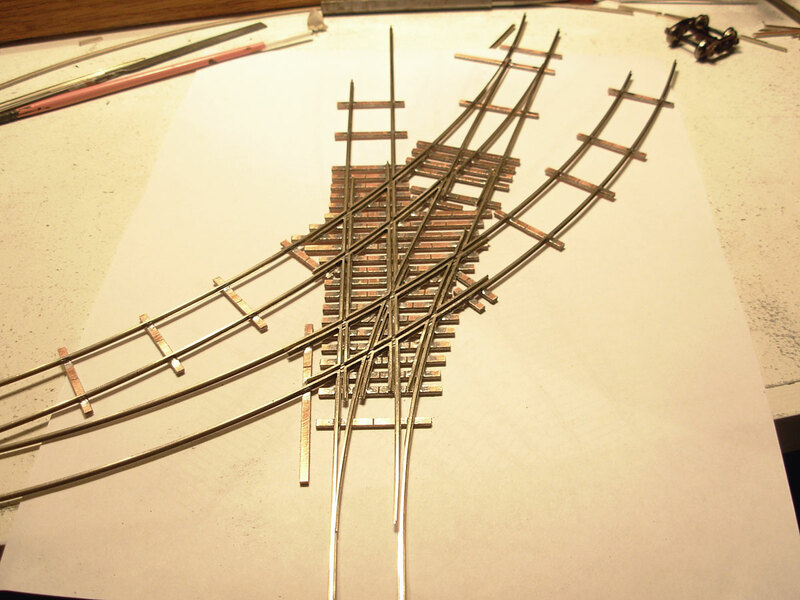 The three lapped turnouts are the most complex portion of the trackwork, and I should have started with something simpler, but I was looking for a challenge. Here is a shot of the real thing. If you look closely at the image above two rails can be seen protruding from the right side of the lower turnout. These rails led into the engine house and never actually crossed through the turnout, they crossed over it. To get to the engine house the crew had to lay steel rail across the top of the turnout, and drive over it! I am not making this up, they actually did this for decades. If you look close, a support can be seen in the middle of the turnout for the rails. The portable rails can be seen on the lower right side of the image. If you look closely at the lower left front of the engine in the large version of this picture below (click on the picture) the engine is sitting on these pieces of rail on top of the turnout. Here is a short video showing a set of wheels rolling through the complex trackwork. It operates extremely smooth, I am very excited with how it turned out and am looking forward to the next piece of the Bronx puzzle. Click on the right facing black arrow to start the video. Since there are lots of posts on this blog that are not necessarily related to the building of the CNJ Bronx Terminal, relevant posts about just construction can be tricky to follow. To help make it easier to follow along with the building of the layout, I have added a “Next Section” link to the end of each post that deals with the build. Simply click on that link to move onto the next post. You can follow these all the way to the most recent relevant post. And I’m scared of laying a plain old #6…. Hi Tim, outstanding work. I almost know what you went through, I had to build partial turnouts on my model of the SS Badger. 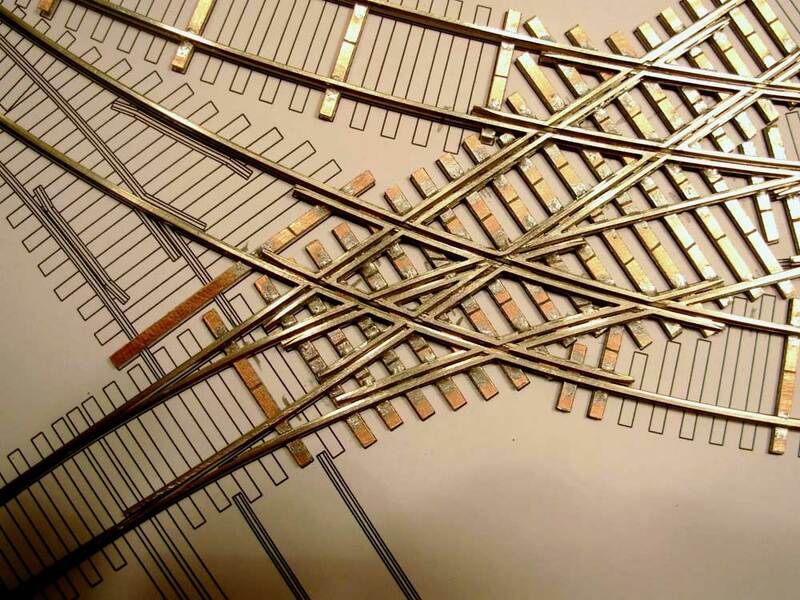 The bracing for removable tracks you refer to, could they be turnout actuators arms instead? Looks great, stunning actually. Its amazing where one inspiring book can lead a person, eh? And finally back to the terminal. Wunderbar. I’ll be following your progress, hoping to learn a lot in the process. Tim, you’re mad! MAD I tells ya! That’s some incredible trackwork you’re doing. Simply amazing. And the subject is incredibly cool. One thing I’m not sure I’m clear on from the map – was this completely self-contained? The only connection these tracks had to the outside world was by car ferry? thats a very good work,its great!!! Hi Tim! Finally I found my way into your site. Wow! It�s impressing! Myself I will stay happily put with turnouts that can be done with your more normal fixtures. They made me sooo lazy. But still I wish I could……… and realize I will continue doing just that! It takes me ages to custombuild just about anything. Well you�re a living proof that the most impossible things can be done… by some… guys. The way of letting track climb on top of other tracks as is on your to say the least complicated track was quite common on seldom used connections here in Sweden. In a direct translation to english it�s called what it is in swedish, -climbing turnout. 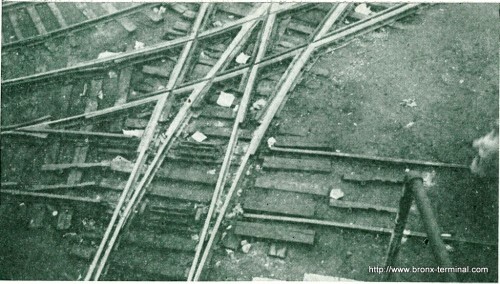 The most common use of this turnouts was to connect hidden engine depots out where mainlines passed through deep forests. This system as far as I know was to keep the depots hidden from spy satellites. Permanent tracks with roadbeds would be harder to camoflague from the enemy spy aircraft ( read USSR ) in the cold war era. Hundreds of steam engines where “conserved” for eventual electrical power sabotage in the case of war around the country. All mainlines in Sweden are electrified since the 40-ties. Wood and water is the only easy to get, local power source if we were to become under “siege” .so the idea was to keep all standard steam engines in running condition hidden in war depots out on the countryside. This system was abandoned as late as the early 90-ties. Anyway this piece of “portable” trackwork is a really interesting piece. I have drawings and some photos of this if you would find it interesting to look at. I just have to locate them as the unpacking is in process after our last move. Great job Tim! Very inspirational. I look forward to following your progress. Please contact me about a potential article for Model Railroad Planning Magazine (Kalmbach annual) as a follow-up on Charlie Conway’s article on the Lackawanna’s Harlem Terminal RR in the 2007 issue. Hi Tim! I just have to look in to your site now and then to get inspiration. I am seriously jelous of your skill. Joking! I am very happy with the fixtures you made for me, even single wheelpairs run smoothly through, amazing! And it looks so good! I hated turnout construction before the Fast track era. Thank you for the advice on the filing jigs for the dual crossing. You were right, looooots of tiny pieces to produce in the right angle. Without your tools I would probably been better off spending my money on a shrink. Congratulations on a superb piece of modelmaking. 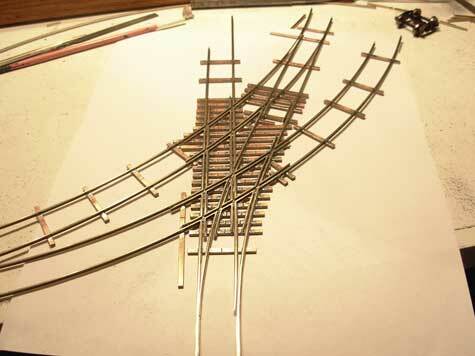 considering the standard you have achieved I am a little surprised you were so nervous about tackling it………….it would suggest you are an experienced modeller. I find it stimulating and encouraging to see work like this, rolling up your sleeves and tackling something so different and new is both brave and energising. please follow up Tony Koesters invitation to write it up for publication the wider modelling world needs to see work like this and to learn how such results can be achieved. Carry on the good work…………your site is now on my Favourites list. Amazing piece of trackwork, astounding workmanship, very very impressive. I have enjoyed your site for a few years, keep up the fantastic work. Really enjoyed reading this. I have a slight preference for this over the Harlem Transfer Terminal which is similar. My favorite characteristic is the design of the freight loading doors of the freight house allwoing a string of cars to be pulled up to them spaced for the right interval! I’ve actually been on the ground where this was as also I have been to the Harlem Transfer property. They are both delights of ingenuity. I look forward to your updates. What a project, but it looks like you’re up to the challenge. I’d like to see the gapping and wiring for that beast. I’m glad to see someone modeling the old industrial areas. I’ve given strong consideration to modeling the Wilmington, DE waterfront along the Christiana River. There were several ship builders, a RR wheel foundary, a couple of RR car builders, and a small steel mill along with a good assortment of frieght transfer warehouses, some livestock pens and other stuff. It was served by the PRR, B&O, and the Reading. The trackwork was almost as nuts as yours. I just poked around at some of your photos. You are such a good modeler you should really consider getting Helicon Focus software. Check out their web site and you will be amazed at what it can do. There was an article about using it for model photography in the Keystone Modeler a few month ago. Absolutely wonderful workmenship. For what it is worth I grew up in the south Bronx in the 1950s and played in this yard as a kid. The engine house was under the bridge going over the Harlem river. 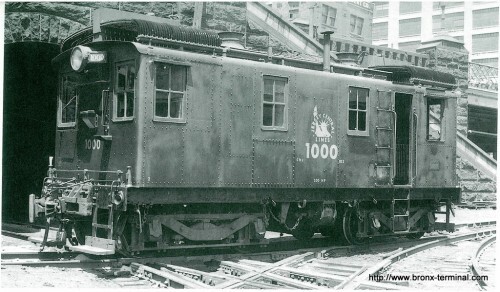 the doors on the freight house were spaced for 36′ box cars and it was interesting the moves made to unload 40′ cars. Keep up the great work and I will keep watching. said they were nonextant there. structures when viewed from above. the east side boundary of the CNJ in the process. the street into the CNJ yard to make a connection. Saw your Boxcab model and have a source for power trucks to fit it. Go to http://WWW.hollywoodfoundary.com. They are an Australian outfit who sell motors and power trucks for all gauges. There is a 7′ wheelbase 36″ wheel option that should fit your Boxcab. whats the late news on your plan for a laser cut car float????? Amazing !! Only a perfectionist can come up with what you have come up with. A conqueror spirit. Well done ! Am contacting your service section to get advice on the best combination of your products to buy to construct my new layout. Regards from Australia. Do you have a newsletter to sign up to? I have been going over this Bronx Terminal site you are recreating and it is very impressive. I can see why you dove head first into the challenge of it. Starting at the hardest part is not unlike anybody that is obsessed with a project. I know because I live from one obsession to another. My latest is a 44 foot long On3 module project in 9 sections with all track being hand laid with your fast track products. Having never worked in On3 before or never laying hand made track is only a few of the required things I need to learn to pull this off. Your latest on-line newsletter helped to ease my pain and you must of increased the audio on the videos because I can hear them now without earphones. 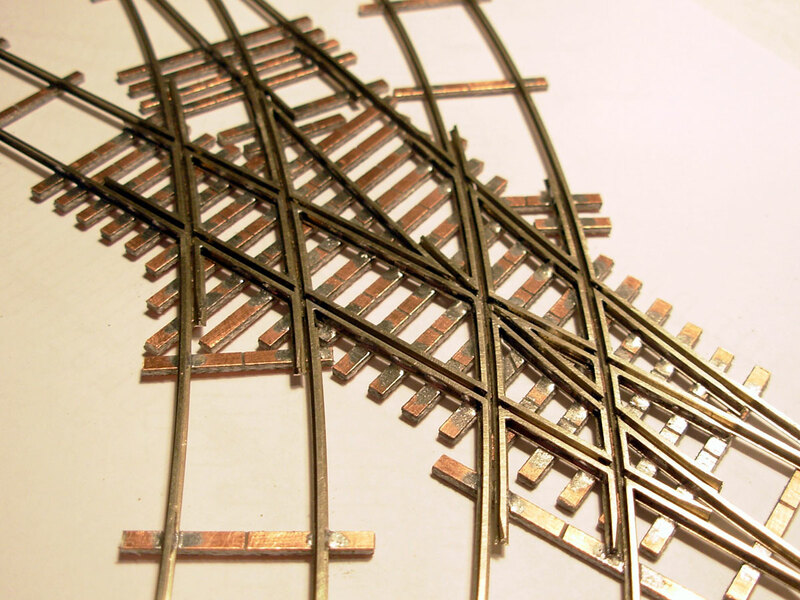 I am excited to start building track and turnouts now that the modules bases are ready and you have made me feel that once I get started I will find that this monster track can be tamed and become a pet project. Thank you for sharing your methods and designs with us all. Well… I proabably committing all of the sins… I don’t have a website… I’ve only been model railroading for 3 years… and I do O Scale. However your weathering techniques are incredible. I am painting an undecorated woodside reefer. When I’m done I will be putting some custom decals on it that I designed. Then… I’m going to follow your great steps for weatherizing. As a teenager a half century ago, I recall seeing CNJ’s Bronx Terminal. 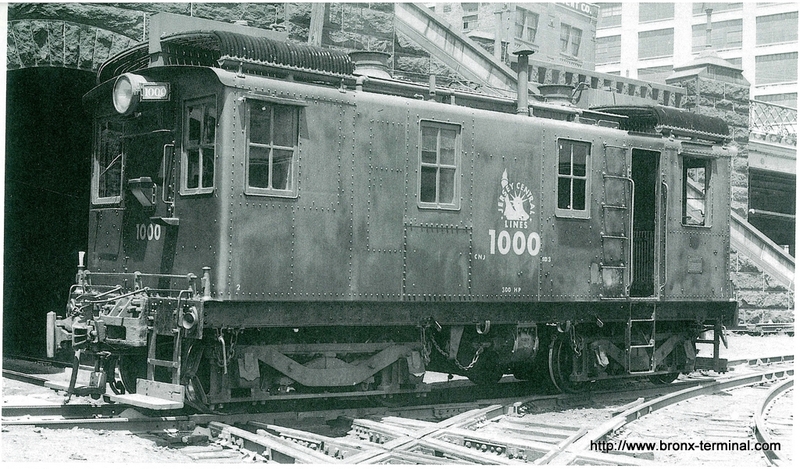 I recently came across the following photo of the CNJ #1000 boxcab which I have never seen before, have you? Thanks for the link to the image. I did have that image, although not as good quality as the one in the link you sent. I don’t recall where I got it from either. Thanks for sending it, its a good addition to the collection. 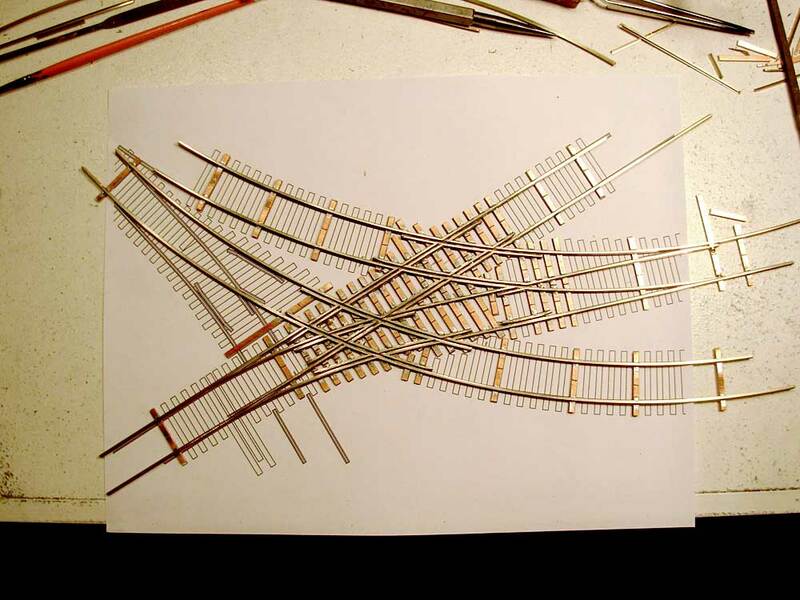 Great model trackwork! Where can I see latest pix? Great work, great site! I would like to send you some CNJ stuff I have, but wasn’t able to locate an e-mail address…HELP! I am no expert. Just a model railroader since the ’40s. In yard tracks or in old industrial tracks, I believe that little or no ballast was used. No high speed traffic to worry about. In the East, if ballast was used it was most often ashes from locomotive fireboxes. 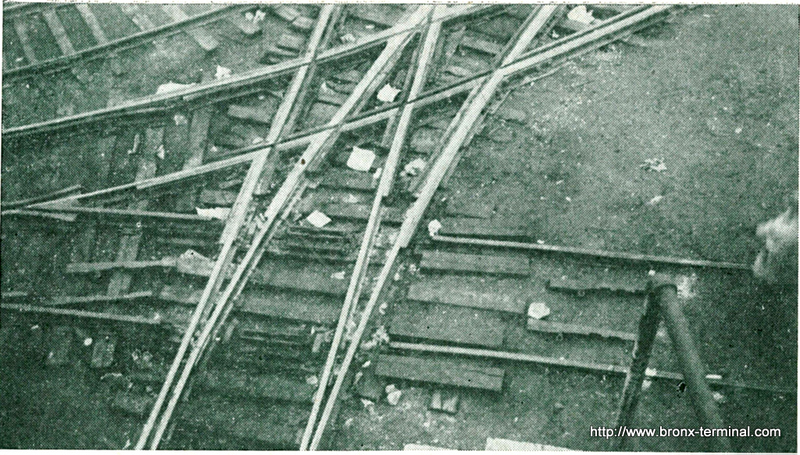 Over the years the little ballast that was used would sink into the dirt and the color of the ground in and around the tracks would be the color of the dirt that came up through the ballast. Where ever there was heavy foot traffic to load or unload freight cars dirt would be brought to level the surface between the ties so that the workers would not trip while working. After decades the ground would look similar through out the yards except at turnouts where track maintenance was needed and in areas with little foot traffic. In the areas where the ties could be seen, the ballast was coal ashes. Locomotives of the day created a lot of coal ash and they had to do something with it. I have no way to confirm this. It is only my observation of years of looking at pictures of track and its environment. If this is something you could help us out on, please feel free to contact me at 917-662-3632. I would so greatly appreciate it. Or if you know where we could get one, that information would also be greatly appreciated. Thank you in advance and be well.